Lisa sparkle and stamps: Shut up! Now here's something I hadn't taken into account when taking photos of my creations. I quite often lie my makes down on some interesting paper as a nice background. Well, when I did it with my wise owl....... it didn't look quite right. Now I think that makes old owlie pop out a bit. I'm thinking of blowing this up to A1 size and hanging it over my desk at work. Yes, it's been that sort of week. Already. 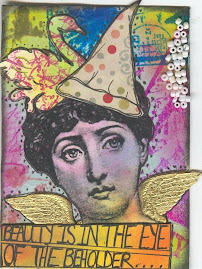 I'm entering this into the Stampotique Designer's challenge 137- Textured backgrounds. I made this using the Distress Ink, spritz and dunk technique, for lots of foliage type texture in the background. Plus some background stamping. I also like to stamp over a dark background with white ink for a spot more impact. Anyway, better take my owl's advice, eh? Shut up Lisa! Fabulous tag, loving the pink owl! Thanks for joining us again at Stampotique. Oh, my, Lisa! This is totally brilliant and sage advice! 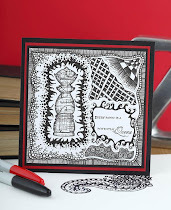 That Bla Bla Bla stamp provides just the perfect background, doesn't it? 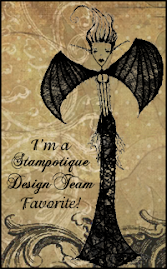 Thanks so much for participating in the Stampotique Designers' "green" Challenge this month! It's amazing how much difference it makes! Great tag love that owl!